Award Winning #1 Booked Elvis Tribute Artist in San Antonio and Surrounding Areas!!! He is able to portray the 50's, 60's, and 70's Elvis. The crowd starts screaming and cheering the second he steps out to perform. He charms the crowd whether it's a small party or The Big Stage. He does shows with his professional tracks and lights. He has a Top Notch Band for major events. He has performed for some of the Biggest Well Known Companies such as, Google, Rack-space, DR Horton just to name a few. He does Birthdays, Anniversaries, Weddings, Nursing Homes, Backyard Parties, Special Need Agencies, Restaurants and Fund Raisers. Book him for your next Party or Event. You'll be very glad you did. Travis performed as Elvis for my husband’s 60th birthday party. He put on such an awesome show that people down our street heard him and came and celebrated with us!! I highly recommend booking him and can not wait to have him back for another party! It was so much fun celebrating your Husbands birthday. I had a wonderful time!! I look forward to seeing you all again!!! WE SAW TRAVIS ENTERTAIN AT THE GRAND OPENING OF A RESTAURANT IN NEW BRAUNFELS, TEXAS. I'VE SEEN AND HEARD DOZENS OF ELVIS IMPERSONATORS OVER THE YEARS, AND HAVE NEVER EXPERIENCED THE ENTERTAINMENT THAT TRAVIS PROVIDED. HIS VOICE WAS EXCELLENT AND THE MOVES SPOT ON. FROM EXPERIENCE, DON'T WASTE YOUR TIME ON ANY OTHER ELVIS IMPERSONATOR IN TEXAS, TRAVIS IS THE BEST. Wow!!! Thank you so much for the review. I really appreciate that. Thank you for coming out to the Show. I'll be there again on February 10th if you would like to come again. I have a full show coming up with some other guest. It's going to be a lot of fun. Thank you again. Great voice, energetic, considerate, great show. Very happy and glad I booked him. Everyone had a good time. Performed non stop for nearly 90 minutes. Travis made me look like a Champ! Travis you are a true professional! Thanks for your dedicated hard work! What a Party!!! That was a lot of fun!!! Thank you for having me there. You all are wonderful people. Keep in touch. Jacqueline I had such a wonderful time performing for you all. Thank you for having me be part of your Grandfathers Birthday. Keep in touch. Thank you so much!!! I had a wonderful time and it was great spending time with your family. I was able to get a lot of tips and history or Elvis. Keep in touch. What started as a 90th birthday party, turned into a complex-wide event, and Travis nailed it. An entertaining performance, with great personal interaction, Travis kept the crowd engaged the entire time. Days later, the complex was still talking about “Elvis’s” performance. Throw in his promptness and professionalism and it is a combination that can’t be beat. Travis is also a nice guy… Would not hesitate to use or recommend Travis for another event. Thank you so much for having me at your mothers birthday celebration. I'm really happy everyone had a great time. It was a wonderful time. Keep in touch. Thank you so much. It was a lot of fun performing for you all. Keep in touch!!! Electrifying ! Great Fun Entertainment for One and All! Our Son 's 21st Birthday 50's Bash celebration! Travis Hudson a Elvis performance Artist was chosen through Gig Salad. We were impressed with his graciousness and professionalizm . Travis went above and beyond to give fine performance! Our family recommends Travis Hudson highly. Most importantly, our Son HAD a great Entertaining experience with Travis! Hi Debbie. Thank you so much for having me. It was so much fun and you all defenitly know how to throw a party. I'm really glad your son enjoyed his birthday. Keep in touch. This is the second time I've seen Travis perform. Travis is very professional and considerate person. HIs Elvis song list is extensive. He made our luau lots of fun, I would definitely hire him again and will recommend him to anyone. In one word? AWESOME!!! Wow your party was so amazing and a lot of fun. You all are so wonderful. Thank you for me again. Keep in touch. Take care. Travis was punctual and the crowd absolutely adored him. 100 percent rehirable. It was a lot of fun. Lots of wonderful people. Thank you again for having me. Have a wonderful day. We had a group of about 50 classmates for a 60th reunion. We were teens when Elvis burst on the scene. Travis did a great job, not only on the music, but involving the audience as well. He also did a moving tribute to the veterans with " American Trilogy". It was such a pleasure performing for you all. You all were a wonderful crowd. Thank you having me. Keep in touch. Travis did an excellent job! We had a great time! It was a blast! I would recommend Travis to entertain at any party! Travis helped me give my special someone a really memorable Valentine's Day. He sang pitch perfect and was on time and professional. The jumpsuit and shades were spot on, and everyone enjoyed his show. Would recommend and book again - very professional and great communication. It was such a pleasure meeting you all. It was so much fun. Thank you again. Keep in touch. Hi Nancy. Thank you so much for the wonderful review. I truly appreciate it. Thank you again for having me and I'm super happy your mother had a wonderful birthday. You did a great job putting it all together. Keep in touch. Travis put on an awesome show at the beautiful Texas Theater for our Guadalupe County MHMR employees. The audience loved him! They didn't want him to end the show. I will definitely be calling him again. It was such a pleasure to have performed for you all. I'm really glad you all enjoyed the show. Have a Happy New Year. Keep in touch. My daughters sweet 16 was great. Travis did an amazing show, all my guest enjoyed. Travis has a unique and original talent , singing, dressing and dancing as Elvis Presley. I do recommended him 100%, Travis it's very punctual and he was ready for his show, his personality it's kind and lovely. It was great having him for our party. Thank you so much Paola. It was such a pleasure being at your daughters birthday. You all are a lovely family. Keep in touch. Oh my!!! Worth every penny!!! Elvis was so easy to work with. There was a hiccup with him receiving our deposit in the mail, he was kind, professional and understanding. The day of the party I was nervous, the party was outside and the weather was not cooperating with the decorations. Turns out I worried over nothing, once Elvis showed up no one cared about the decorations. My daughter had 50 teens from all over Texas. We live in central Texas and her guests were from, Dallas, Houston, San Antonio and other areas. Elvis had them all dancing together like they had known each other forever. A moment I will remember forever, when Elvis sang " I want to be your Teddy Bear" to my daughter. She beamed as though it was the King himself! We were so impressed that we are hiring him again for another event in March!!! Thank you so much for having me at your daughters 16 year old party. It was so much fun and I'm glad everyone enjoyed it especially your daughter. I look forward to seeing you all again in March. Trelvis did a wonderful job at our mystery dinner fundraising event last night. I received many positive comments after his performance and several calls today, telling me how much they enjoyed his performance last night. He not only has a good voice but is extremely personable so he relates extremely well with the audience. I highly recommend him as he was a good investment for our fundraising. You alls event was amazing!!! What you all do so special for those babies. It takes special people to do what you all do and I am so happy to have met you all. I am so happy everyone enjoyed the performance. Keep in touch. Trelvis was awesome. Very professional and put on an awesome show. Very entertaining. We loved it. The birthday girl had a blast!! Would definitely book him again. It was such a pleasure being with you all. I'm so happy that you all enjoyed the showed especially the birthday girl. Keep in touch. Trelvis gave a magnificent performance! Trelvis came to the Grand Opening of my small vintage fashion boutique in San Antonio, TX. His Elvis impersonation was GREAT! He performed Elvis moves down to a tee. He sang my favorite popular songs. The audience really enjoyed themselves and have not stopped texting or calling for such a great entertaining afternoon they had. I highly recommend Trelvis and would welcome him back on another occasion. Thank you. You have an awesome store!!! It was so much fun performing for you all. Thank you for having me there to be there for your Grand Opening. It was a real treat!!! You all were great!!! Keep in touch!!! My staff & residents totally enjoyed Trelvis' performance. They are still talking about it today with all smiles and compliments. We plan to have Trlevis in the house again! It was such a joy being part of ya'lls appreciation celebration. Everyone was very friendly. Take care and see you all later. I have heard many Elvis impersonators, never one like Trelvis. His voice is the closest to Elvis that I have ever heard. His manner of speaking during the performance takes me back to the time when I would watch Elvis in concert and he would talk to the audience. I think Trelvis channels Elvis perfectly. Highly recommend!! Even if you don't like Elvis much, Trelvis will get your party hiped up!! Great impersonator, singer, dancer and he's funny! No disappointments here!! Great show and a really nice person. Beautiful voice with a range that can do a 20 year old Elvis and a 40 year old Elvis too. Even Elvis couldn't really do that! He does a nice respectful tribute without making it an over the top caricature. Friendly and likes to hear your Elvis stories too. The adaptability criteria doesn't have enough stars to rate the "Trelvis" show at our 50th Anniversary party. We will all be traveling around to catch his shows whenever possible. Thank you Jo. That means a lot. It was a pleasure being part of your Celebration. Keep in touch. Trelvis did such an awesome job helping us make my parents' 50 th anniversary special. From hiding from my Mom so he could surprise her to sitting down with the family for conversation, he was a charming entertainer. He played an awesome set of Elvis classics, beautiful voice, totally cool lights and music set up. We are hoping to see Trelvis at some of his community gigs too. Wonderful 50th Anniversary Celebration. You all are amazing. It was a lot of fun performing for you. Keep in touch. FABULOUS! Trelvis made our party a success! We hired Trelvis for a graduation party and he was so fun! His voice was so real you could close your eyes and it would be like you were taken back in time! He interacted with the crowd and everyone had such a good time! I would strongly suggest you hire him for any event! Thank you for the wonderful review. It was so much fun being at the graduation party. You all are an awesome, fun group of people. Keep in touch. Trelvis rocked my surprise birthday party!! Trelvis was given to me as surprise birthday present at a party in my home. I don't know how he pulled off being so quiet while we all ate TexMex in my backyard. As soon as we were all through eating, my brother called us in for a neighborhood appropriate show that had everyone at my party doing the twist and recording videos. He even facetimed with my grandson and complimented his hair. Trelvis was so personable he became like a member of my family! Lisa it was such a pleasure being able to perform for your birthday!!! You all were great. I hope you have many more birthdays. I'm glad you were surprised. Keep in touch. Trelvis was fabulous! Beyond our expectations! He was extremely professional in his communication and presence. His performance was fantastic! He captivated the crowd and got our guests involved. Trelvis is on our list of "must have back" and we look forward to following his success in the future. Hey Punky. You all know how to have a great party. It was my privilege being there with you all. I look forward to seeing you all again in the future. Keep in touch. Leonard, it was such an honor to have been able to perform for your Aunts birthday and for everyone who attended. You all are an awesome family. Keep in touch. Trelvis was absolutely amazing! He was so professional and kept me informed about scheduling times and music, I didn't have to worry about anything on the day of our event and he was so gracious with his time and expertise. Will definitely bring him on again for future events! Hi Angelica. It was my pleasure to have been part of you alls Lupus Foundation Event. It was so much fun. Keep in touch. I was very pressed with his performance. I would highly recommend him. Trelvis put on an awesome show! The sound system ,the backdrop lighting,his costume was terrific, his singing was outstanding! He kept everyone on their toes....several had to get up and dance! Highly recommend him for your gatherings! Hope to hire him again! Trelvis was AWESOME! Over 200 people and everyone enjoyed!!!! Hire Trelvis for your event! Travis was our guest appearance at our company Christmas Party this year. He was a huge hit among our 300+ guests. Very professional and good at what he does! Our guests raved about his rendition of Blue Christmas! Hire him for your event! I can't say enough wonderful things about Trelvis. He worked closely with me for almost a year and kept the energy level up way before the party. His performance was a huge success and his 'fans' couldn't get enough! My mother's face was priceless when he started the show and she couldn't stop smiling. His positive energy was felt throughout the venue and my guests are still talking about his performance. I hadn't met TrElvis until the day of the party. Was I impressed! He put on a great show that the guests talked about it for days. He just made my fiance's party the more special. Thank you TrElvis for staying in contact with me as I made final preparations and through the very end. 100% satisfied with you & your entertainment. Elvis is alive and rocking thanks to Trelvis who made my parent's 50's theme party a big success. Trelvis swooned the ladies and his vocals were dead on. Trelvis was a great entertainment value and recommend him highly. Trelvis did a fantastic job for my 2 year old daughter's sock-hop birthday party. He dressed as the 50's Elvis and handed out teddy bears to the kids. He showed up early, was professional and courteous. My daughter was mesmerized with him and he kneeled down singing directly to her, it was the cutest! He sang for exactly how long he said he was going to. Worth every penny. Everybody said what a great time it was. Even my mom said it was the best party she's ever been to! I highly recommend booking Trelvis if your looking for the perfect Elvis impersonator in San Antonio. It was so much fun being at your daughters 2 year old birthday party. I'm glad that you all are Elvis Fans and especially your daughter. Keep Elvid Alive. Thank you for the opportunity. Very entertaining. Definitely worth having for an event. From his grand entrance, to his touching “Let me be your Teddy Bear,” dedicated to a grand lady turned 90, Trelvis (Travis Hudson) was sensational. He turned what would have been a hum-drum birthday-cake gathering into an inspiring, uplifting “celebration.” His showmanship was fun, always in character, and a joy to watch. The electronic screen with ELVIS in large red letters added to the atmosphere and formed a great backdrop for his performance. The ladies screamed like teenagers with every Elvis flip-of-the-hip, and everyone posed with him for pictures. For a special day, you can’t go wrong with Trelvis. Hi Mr. Allen. It was an honor to be at the 90th Birthday Celebration. It was a lot of fun and I am so glad everyone enjoyed them selves. I enjoyed seeing smiles on everyone's faces. Keep in touch. Truly an awesome experience!! I asked Trelvis to come sing for my husband's birthday party, and he went way above my expectations--from the timing (it was a surprise!) to the personal touches, it was a blast and a very personal birthday present. We won't forget that night!! Thank you Trelvis!! Trelvis made our wedding day totally awesome! He had all the older generation going "gaga" over him! He sang and he was a real sport and took pics with the older ladies and even some of the younger generations! He was very convincing and made it seem as we were his only clients! I know it was a memorable wedding not just for us but for everyone! Thanks Trelvis! It was my pleasure to be there for you all for your wedding day. I'm glad you all everyone had a wonderful time. May you have all have a many wonderful happy years to come. Travis did an excellent job as an Elvis Impersonator at the Keep Austin Weird Festival! He was certainly a hit and we are looking forward to having him again next year. He was very professional and it was evident that he took his craft very seriously. Great job Travis, can't wait to see you next year! We booked Trelvis to come in and do a few songs for a friend's luncheon/shower prior to her going to Vegas to renew her vows at the Elvis wedding chapel after 45 years of marriage. The booking went easily and we had good communication back and forth. The performance was great and all enjoyed themselves, especially the "bride". Thanks, Trelvis!! It was a night everyone will remember with a big smile. Trelvis was very exciting to watch perform. My sister's birthday party was an evening to remember and celebrate. My sister is a big Elvis fan. Trelvis was the perfect birthday gift. He was very gracious and inviting to everyone. Trelvis is a true reflection of the Elvis we all knew and loved. It was my pleasure to be at your sisters birthday. I enjoyed being with all of you. Take care and keep in touch. Amazing!!! My wife was so excited and surprised! Trelvis was fantastic and even let some kids on stage to dance with him. Very interactive and all the guests had a great time. I HIGHLY RECOMMEND HIM for any special event or just a fun time! Thanks for making my wife's party a huge success! Dusty!!! Wow what a party!!!! It was a lot of fun and great people. I had so much fun performing and being with you all. Keep in touch. Trelvis did an amazing job performing at my dad's 65th birthday party! His voice was awesome, his look was perfection, and he was so good with the guests and getting them involved. He was a huge hit and everybody loved him!! Natalie, it was a pleasure to be part of your Fathers Birthday. I enjoyed everyone there and it was so much fun. Keep in touch. Thank you so much for having me at your Event. It was so much fun. I'm glad you and everyone else enjoyed it. Such a wonderful crowd!!! I look forward to seeing you all in the future. Thank you very much. Thank you so very much for the review. I am so glad that you enjoy the songs and singing and performance. Trelvis was the life of my husband's surprise party. My husband is a huge Elvis fan and an even bigger critic, but he was blown away by Trelvis' show. We would highly recommend Trelvis for any occasion! It was so much fun to perform your husband suprise party. I'm really glad I met his approval. You all were a great crowd. Keep in touch. Elvis got all the women going again! Trelvis was awesome! We had the opportunity to get Trelvis to come surprise my motherinlaw for her birthday party at her assisted living home. He was a hit not only for her but for everyone that could see or hear him everyone joined in. He really worked the audience and made everyone feel special. He is fun, professional and really has a heart for it. You definitely get your money's worth. He definetly has studied Elvis and knows all his moves, apparel and songs down. He's the real deal! If your looking for Elvis he's your man! It was my pleasure to there for you all and for your mother. I had a great time. Thank you so much. I'm glad everyone enjoyed themselves. Keep in touch. We hired Trelvis to entertain at my mom's 75th surprise birthday party. He was wonderful. He is very easy to work with. He is very professional and answers any and all questions quickly. We communicated by phone and email and his response to my questions were within the same day if not within a couple of hours. Trelvis was very sweet to my mom. He gave her a teddy bear for her birthday and then sang Teddy Bear. She loved it. We hired Trelvis for a 30 minute show and he sang many Elvis hits. Our guests really enjoyed the show and many came to me afterwards and said how much fun they had. I would highly recommend Trelvis for your event. I am so happy that you all enjoyed the show and especially your mother. It was a great birthday party. Thank you for the wonderful review. Keep in touch. Let me say first off that I saw the reviews and was skeptical , but I gave it a try anyway AND I AM SO GLAD I DID!!!!! For everyone (even all the bystanders who came over and just had to be part of the action). Trelvis was a true gentleman and greeted and took photos with all comers, which was so cool because everyone had to be part it. After all TREVLIS was in the building!!!! Very highly and unconditionally RECCOMMENDED! Thank you so much for the wonderful review. I am so glad that your wife enjoyed the wonderful surprise that you pulled off. Have a wonderful day. Keep in Touch. Trelvis was out of this world. He did the young and the older Elvis. He has his act mastered. Our conference attendees enjoyed it very much. He walked around and interacted with everyone too. I think he made a lot of the ladies blush. We would definitely have him back. Best entertainment at any of our 19 conferences, yet! Thank you very much for the review. I am glad I was able to be a part of your PPAT conference. It was a wonderful time. Keep in touch. Trelvis went all out for our event and made some very special people happy. His entertainment was top drawer and he never stopped entertaining. He held the crowd in the palm of his hand the entire time. Great Show at my Party!!! I was looking for someone that pull off doing a young Elvis but also able to wear a jumpsuit and wow did this guy do it!!! I highly recommend him. He is very nice and is workable and also goes the extra stretch for you. He will even stay longer if asked and does not up charge. He got the crowd excited. I couldn't have asked for a better Elvis for my Party. Thanks Trelvis!!!! Trelvis will interact with the crowd and sing the favorite hits of Elvis. During the show/performance he will hand out teddy bears to the crowd and he will give out scarves as well. Depending on how long the show/performance is he will take 15 minute breaks and will take pictures with the audience. He will make sure you and your party will have a wonderful time. He will bring his own equipment, sound, (lights, if agreed to) costumes depending on what type of show. He will stay after the show and take pictures with everyone. Travis Hudson started when he was 14 years old. He asked his mother to make him a jumpsuit so he could dress like Elvis and the rest is history. Travis started doing Elvis shows just for fun and from there people kept asking him to do more shows and to sing more songs. 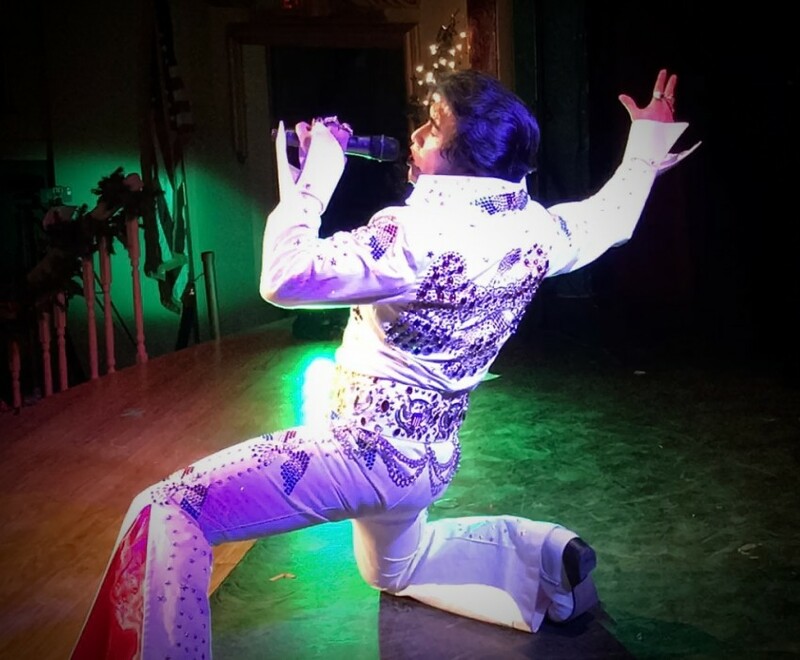 Now Travis sing professionally all over Texas and has been known to be able to portray the Young Elvis as well as the Jumpsuit Elvis. Singing has always been his passion and he enjoys making everyone feel happy where ever he is at. Travis is from Guatemala and speaks spanish. He mainly grew up in Corpus Christi but he has been living in San Antonio for the last 8 years. He now resides in Cibolo and enjoys performing where ever he goes. He makes sure everyone is included at whatever occasion it may be. Victor Solimine is a great friend of Travis and is also his Mentor. Victor has been Impersonating Elvis for well over 30 years. Where ever Travis goes, he is a friend to everyone. Trelvis will have a signed contract between the party and himself out lining what will perform for your show/party. Trelvis will need a wall plug to be able to connect his equipment. A place to be able to wait until the show starts and change into. Example, bathroom, kitchen waiting area, closet if big enough. If equipment is provided, a sound check and mic check will need to be done before the show. If Trelvis is bringing his own equipment, he will need time to set up before the show/performance starts. If it is a restaurant, Trelvis will have a tip jar that will be by his equipment and may be passed around. Any pics that are taken, Trelvis requests that he be tagged in it by adding him as a friend on Facebook at Trelvis Hudson. Trelvis will make sure you are happy and satisfied with the show and asks that a review is left on this site for potential customers to read. I provide all equipment unless Customer is providing.